Originally from Kildare, John graduated from the National College of Art and Design in Dublin with an Honours Degree in Fine Art Sculpture in 2013. He has previously participated in residencies in Bucharest and Reykjavik. His art practice, which spans performance, installation, sculpture and video, has been exhibited both nationally and internationally. 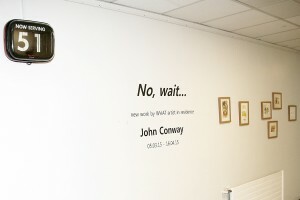 During his residency with WHAT, John engaged patients in creative experiences at the bedside. He himself experienced a period of immobility due to back pain. His journey to recovery became the subject of his first solo exhibition No, wait… which was launched in March 2014 by performance artist Dominic Thorpe in University Hospital Waterford.